With features such as a built-in beaker holder, beaker-top electrode holder and rugged, 2-in-1 pH and temperature sensor, the HI 208 is designed to meet busy classroom environments. 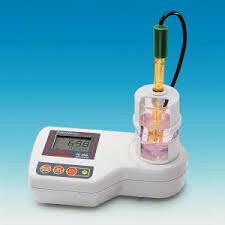 This instrument also features an extended pH range, dual-level LCD with icons for stability and buffer recognition, built-in magnetic stirrer, automatic pH calibration, and temperature display in either Celsius or Fahrenheit. In addition, all readings are automatically compensated for temperature variations.